A couple of weeks ago I spoke at the first Disability Confident Conference which was held in Birmingham. My summary of the day is covered in my previous post “Are you disability Confident?” and you can see from the photos how excited I was to participate. Yesterday I received a “Thank you” from Mike Penning MP, the Minister of State for Disabled People and I was impressed that he had taken the time to make it a very personal one. 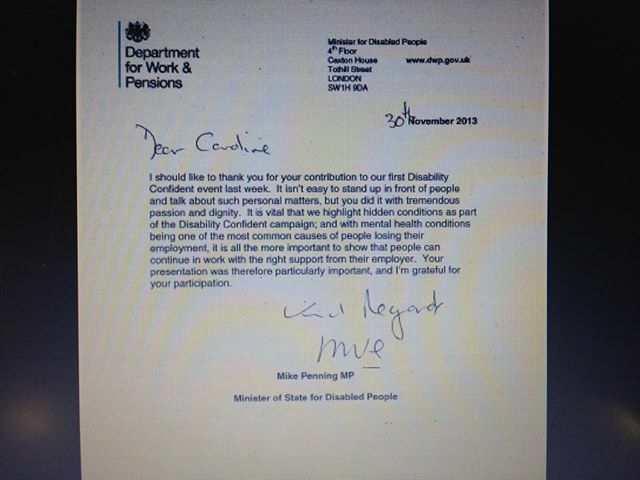 Not only am I disability confident, I’m also confident that Mr Penning is the right man for the job. Thank you-I thought so too. I was surprised to receive it as well.